The Trip (2010) Get it on DVD. Now. I can unflinchingly say that The Trip is the best thing to appear on telly this year. 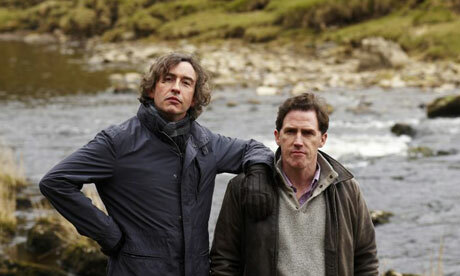 Ironically, it’s based on a concept that sounds less interesting than Countryfile: Steve Coogan and Rob Brydon, two well-known British comics, go for a six-day trip around the north of England reviewing restaurants. Yep, I know. Sounds like a hoot. But here’s the catch. Both men play fictionalised versions of themselves. And there’s no pussyfooting around when it comes to character exploration. The series revolves around a coruscating analysis of Coogan’s character; he’s shown to be selfish, fame-obsessed, and pretentious. (Disclaimer: I’m sure he’s lovely in real life) Brydon is portrayed as an everyman: the grounded, sensible face of family-oriented decency, in contrast to Coogan’s idiocy. It is therefore all the more shocking when Brydon attempts to make out with one of Coogan’s co-workers. It comes out of the blue. During a rendition of Tom Jones’ ‘Delilah’, Brydon playfully leans over the sofa the two are sitting on. He dives in close, but on her flinching back his voice trickles to a halt. I really can’t do it justice: you have to see it, in glorious cringe-worthy technicolour, for yourself. The most brilliant part is that they keep on chatting: Brydon has attempted to conduct an affair behind his wife’s back, but there is no moral retribution. In any other TV show, he would be punished brutally by some twist in the plot: a potful of scarabs would unexpectedly fall on him, or his wife would be inexplicably watching behind the door. But no. They carry on with their coffee. The fantastic thing about this moment is just how true it is. Unflinchingly, undeniably true. There’s no false moral message, or any kind of soap-opera justification in his character (Sociopathy, sexual addiction etc). It just tells you the simple fact: sometimes good people do bad things. Deal with it. Songwriters: this is the ultimate way to avoid cliché. This moment was so good because it was genuinely shocking: the taboo of the sanctity of marriage had been broken, and new moral ground was being explored. The Trip had chiseled out a piece of our collective morality and shown it to be false, with only a camera and a pair of actors. You can too. And you don’t even need a camera.